Sprint racing has plenty of action and excitement as you swim, bike and run yourself around some of Australia’s most stunning locations. The swim leg will be held in the Shoalhaven River with a deep water start. The exit to transition will be adjacent to the sailing club. The cycle leg will be a flat, out and back course. 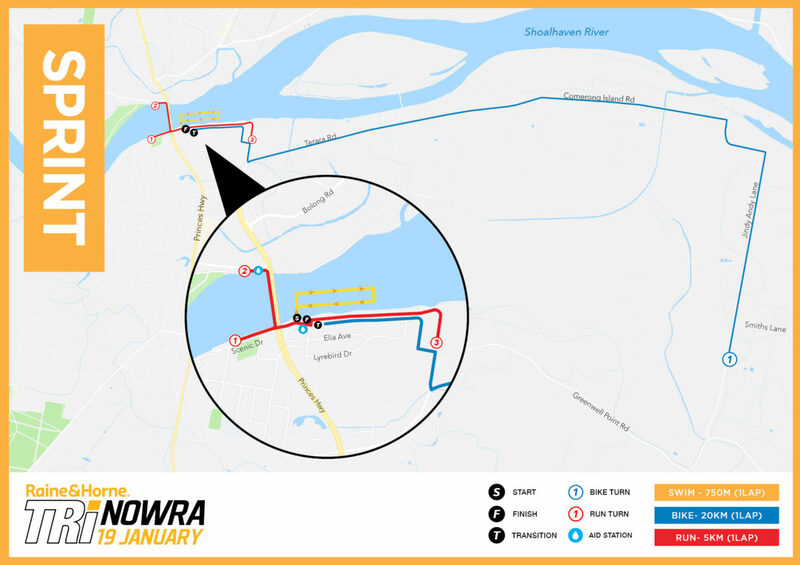 From the transition area (at the western end of Riverview Rd) competitors will head east to Numbaa via Terara along Riverview Rd, Ferry Ln, Terara Rd, Comerong Island Rd and then right onto Jindy Andy Ln. Just past Smiths Ln on Jindy Andy Ln will be the turnaround point. At this point, competitors will turn around and head back along the same route to the transition area where they will ride to the dismount area, dismount and then head into transition. The run course is a mostly flat course. From transition competitors will head west along the path, under and then onto the new Nowra bridge. At the northern end of the bridge competitors will continue up the path towards the first turnaround point. At this point competitors turn around and return to the southern end of Nowra bridge via the same route. At the southern end of the bridge, competitors swing right then left onto the foot path and run past the Nowra pool and rowing club for a lap around Paringa Park, then back along the same path, under the bridge, keeping left along the rivers edge, past the Sailing club and then competitor will veer off the path for a short period as they pass the finish line. Competitors will be guided back onto and continue to the eastern end of the path and then right onto Ferry Lane to the next turnaround point just prior to the Riverview Rd intersection, where they will do a U turn and head back along the same route to the finish line. See course map for detail. Male, Female & Mixed teams, Clydesdales (Males 100kg+) & Athenas (Females 80kg+) will be recognised on the podium and then we have ‘Race Ya Mate’ which has no podium prizes. MINIMUM AGE – team member (one leg of team) – 13 years at 31st December 2018. There is NO leeway on this.